What’s the difference between nematodes? The last two weeks we’ve published articles highlighting the free soil testing for 2018, which is screening for the ‘silent yield robbers’: pathogenic nematodes and charcoal rot. 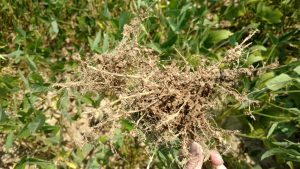 This article gives a brief description on how pathogenic nematodes differ – their effect on yield and different management options. Sustainable and economically sound agricultural production must include optimizing pest management and the first step in doing so is identifying pests – namely nematodes, as discussed here. A soil or sometimes plant sample has to be submitted to a lab to determine the nematode species present and at what densities or population levels. Using the species and population level data, one must decide if control measures are necessary and, if so, which management options should be used. Every field is unique and a field by field analysis has to be done. Plant-pathogenic nematodes feed only on plants and at high populations can severely injure or kill plants and at lower, more typical numbers can cause yield losses without causing any obvious symptoms. Furthermore, the feeding sites from nematodes can allow other pathogens (like viruses, fungi, and bacteria) to invade the plant and further damage yield. 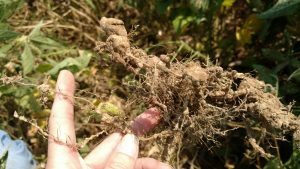 Here are some of the main pathogenic nematodes that may affect field crops in the Mid-South (that are being screened for in the FREE SOIL TEST this year) and some management options – which are meant to be taken as a general guide and not as definitive, and these are discussed in reference only to soybean. In other cropping systems there can be different thresholds and management options. 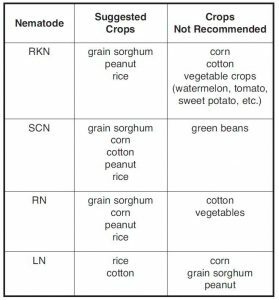 At any population level crop rotation to a non-host will reduce nematode population (see Table 1), although it may take more than one season; and planting a nematode resistant variety can minimize damage to the crop and reduce nematode populations. In general, at low population levels – nematodes might not damage the crop and no action is needed (but it’s good to be proactive on some of the nematodes due to the extreme rate at which they can reproduce ); at moderate population levels – nematodes damage may be minimal and yield may not be affected if growing conditions are favorable; and at high population levels nematodes are likely causing crop damage/yield loss. Image 1. Illustration of SCN generations in one season. Reniform Nematode – Might be the second most common pathogenic nematode in soybean in TN (results from 2018 survey will validate or not). Reniform nematode (RN) has one of the shortest life cycles, completed in 17-23 days at favorable temperatures (81-86 °F) and is usually more problematic on cotton than soybean. With that in mind, soybean/cotton rotations are at higher risk. Spiral Nematode – While many fields have spiral nematode present, only at very high numbers (1,000+ per 500 cc of soil) and the crop has been stressed, will they be able to affect plants. Management options would only need to be considered at high levels and when in combination with other nematodes. Root-knot Nematode – As one might guess from it’s name, this nematode causes knot-like swellings (called galls) on infected plant roots (Image 2). While I had not previously found an infested root-knot nematode field in TN, this year we have already identified three. This nematode is more prevalent in sandier soils. 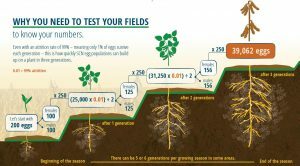 The feeding activity of the nematode induces the gall formation on roots and within 20-30 days, depending on soil temperature, several hundred eggs are deposited into egg masses on the surface of the root. High levels of root-knot nematode (RKN) may cause stunting and yellowing of soybeans as well as nutritional deficiency symptoms. 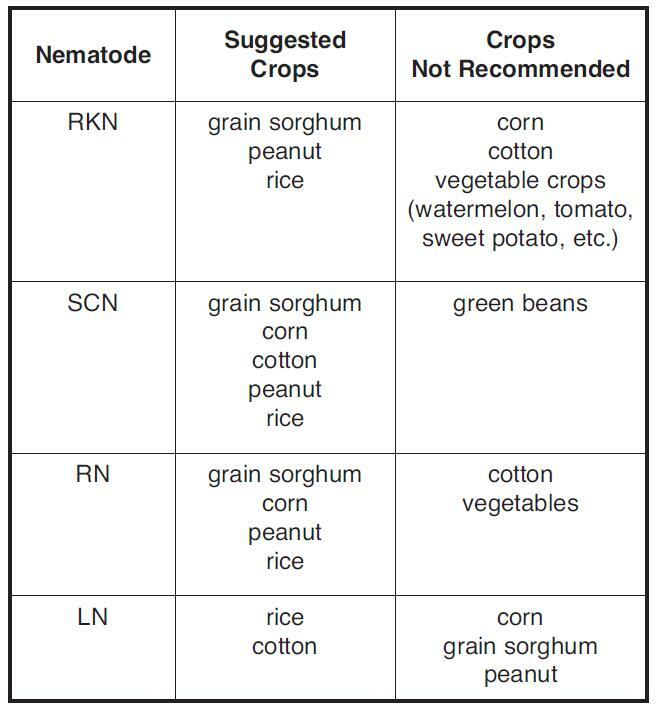 General management options for all pathogenic nematodes discussed include rotating to a non-host crop (see Table 1). Rotate with resistant varieties (and rotate the resistant variety one uses – i.e. never plant the same SCN-resistant variety in the same field twice as adaption to resistance can occur quickly). In some situations, chemical treatments, such as nematicides, may also be beneficial. 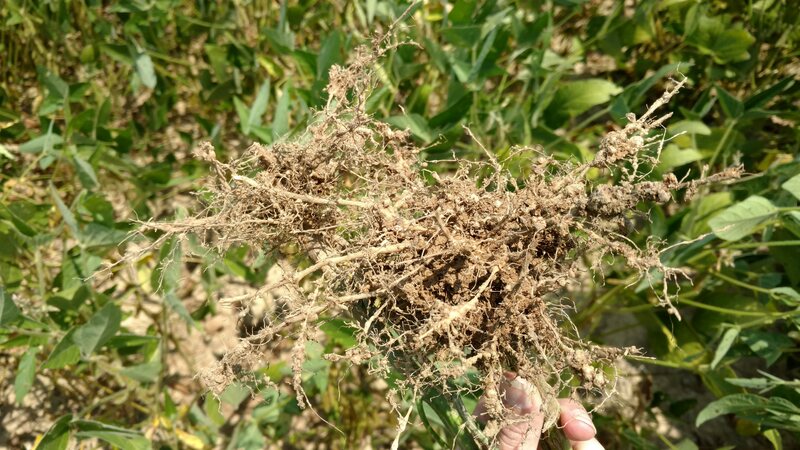 I know RKN, RN, & SCN are Root Knot, Reniform, & Soybean Cyst nematodes, but what is LN? There are also Lance Nematodes, but in my article (the Table from AR pub) the LN is referring to the Lesion nematode. Thanks for the question. This article really helped with me with an assignment for IPM. Thanks for the info!